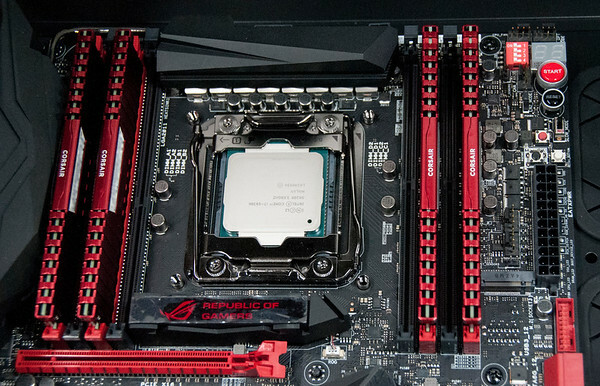 The ASUS Rampage V Extreme (RVE) motherboard includes a rear I/O panel called a Q-shield. This I/O panel was installed in the case I/O opening. It fits well but needed a strong force to make it seat correctly. Next, I checked that all the standoffs were tight. Reaching over the camera with an ESD strap without bumping it made installing the motherboard awkward. Getting the motherboard to seat against the I/O panel took a lot of force. This was a concern as there are a lot of very small components on the board. The standoff in the center of the motherboard is different than the rest as it has screw threads sticking out of it. Angling the motherboard and pressing firmly seem to be the trick to get the center hole aligned with the thread standoff. The threaded standoff kept the motherboard in place while I installed the mounting screws. Next, I checked the connector alignment to ensure that the I/O shield and motherboard were both mounted correctly. Figure 1 shows the RVE motherboard and GTX 980 graphics placed in the 750D case to verify that the motherboard was aligned with the case and that the graphics card was located at the card slot opening correctly. While installing the mounting screws, and check that the graphics card would fit correctly, I notice that the case mounting panel and the motherboard flexed a lot more than expected. The flex can be seen when the memory DIMMS are installed. 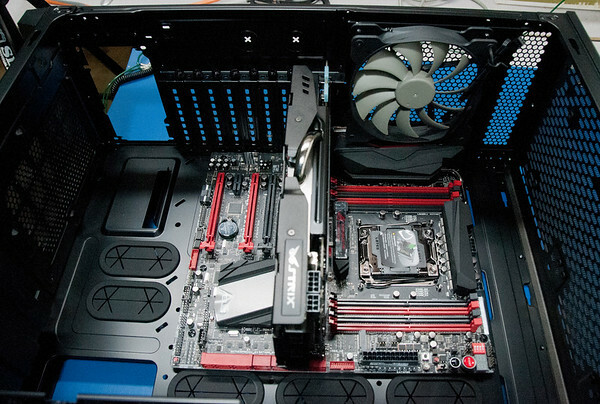 Figure 2 shows the RVE motherboard mounted in the case. Figure 3 shows four DIMM memory kit installed in the memory locations A1, B1, D1, and C1 (red memory sockets. 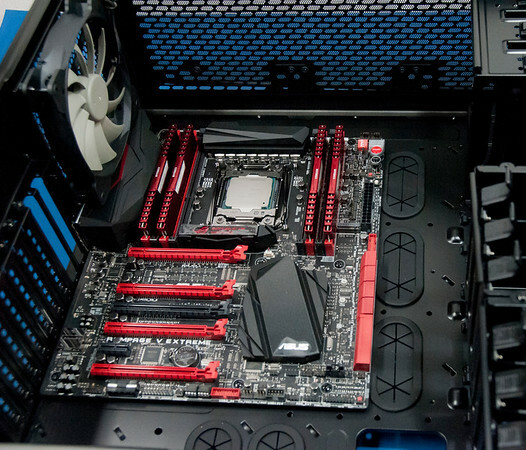 The DDR4 DIMMs are easy to install. You place one end of the DIMM in opposite the latch first and press the other end until the latch clicks (locks). The single latch memory socket is a nice feature for this long DIMM. Figure 4 shows the 2011-3 CPU socket. To open the socket, the left lever opens first and then the right lever can be released. The left lever can then be lifted fully open and that moves the bracket out of the way. The bracket has a plastic cover that must be removed before the processor is installed. It just pops out but takes a little fiddling with it get it to release gently. The Intel Core i7-5930K processor has alignment notches with two notches the top on edge and two on the bottom edge. There is a little triangle on the top right corner too. These all notches match the 2011-3 socket so that process can’t be installed backwards or upside down. 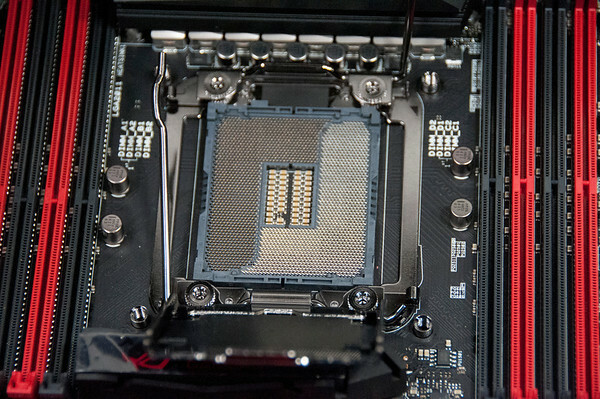 Once the processor is placed in the socket, then the left side lever is partially closed to lower the bracket over the processor. Then the right side lever is closed and latched. The left side lever is the closed completely and latched. The levers require a pretty good amount of force to engage and lock. Figure 4 shows the processor and memory installed in place on the motherboard. 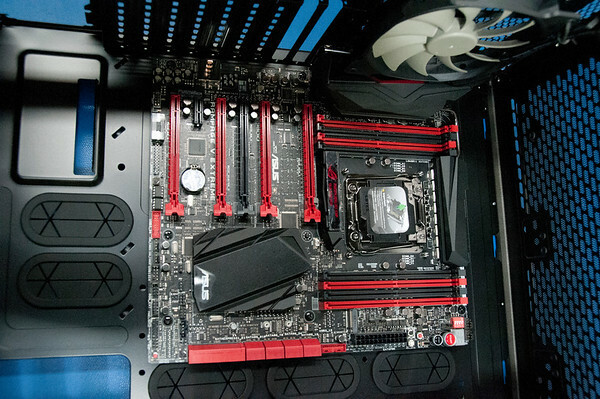 Figure 5 shows installation of the RVE motherboard Corsair DDR4 memory kit, and Intel Hex core processor into a Corsair 750D case. Figure 6 shows the RVE motherboard, memory, and CPU installation video.